As we took a good look at the ‘traditional’ Israeli scarves available on the market, we knew something was missing. We found ourselves wishing they were more. More durable, more long lasting, and higher quality. Yes! These are the FIRST EVER tichels with a Wrapunzel label. We designed them, we love them, and we know you will too! 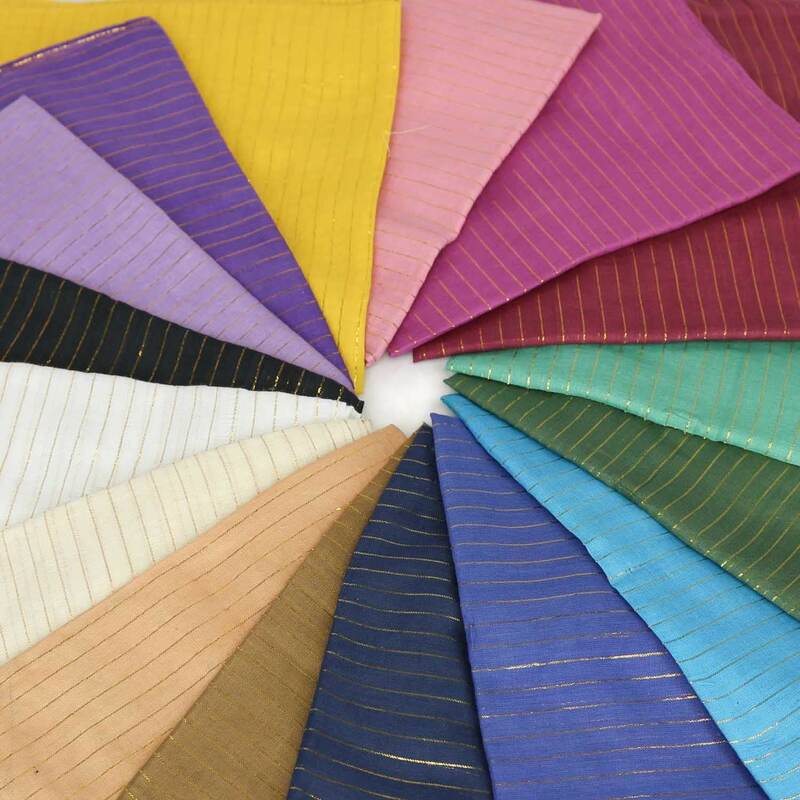 We kept the square shape and the gorgeous metallic threads – but we added stronger fabric and custom colors. And we also got rid of the tassels that many traditional Israeli scarves feature at the edges in favor of a clean, straight seam which will survive wear and tear much better. This is a tichel you can wear on its own and it will last and last. It doesn’t wrinkle easily either and it’s made of 100% cotton! Aren’t Israeli Tichels wonderful? They’re so versatile and they have a simplicity that we just love. You can wear one or layer them up, you can fold them into a sash, tie the ends into a bow at your ear – tons of possibilities! 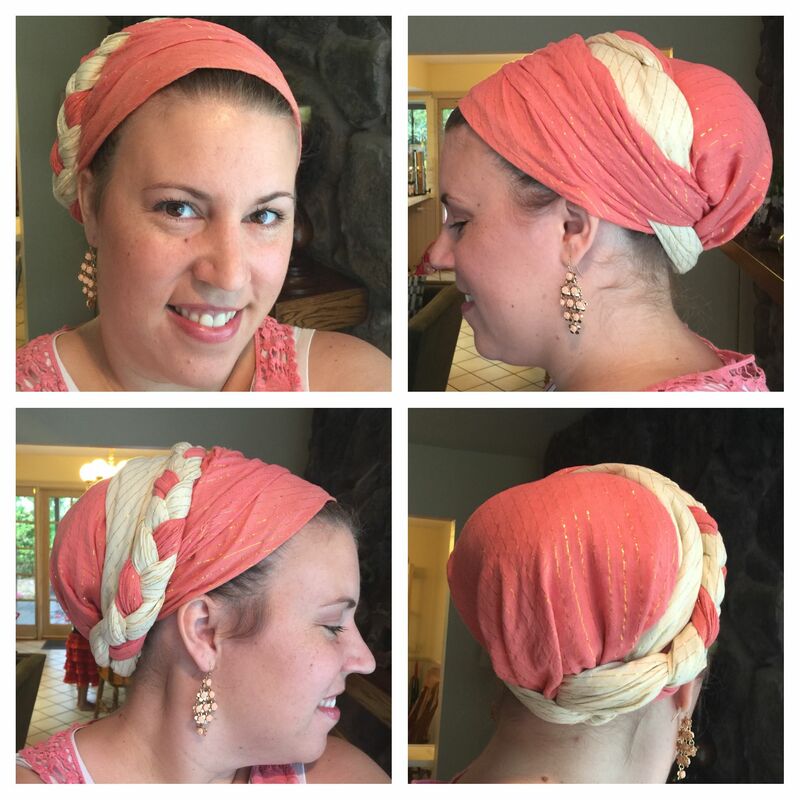 Many women have told us that the Wrapunzel Israeli Tichel is their scarf of choice to wear when exercising. Naomi Rose showcases her workout tichel style in this video tutorial. 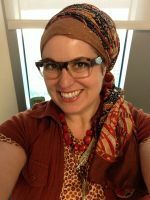 For more ways to wear your Israeli Tichels, check out Andrea’s all-encompassing Israel Tichel video! Love the fabric. Easy to work with. Please, would love to see this same fabric in long rectangular scarves. And would be nice to have a larger size square to have longer tails to work with. Light, perfect for layering. I ordered cream, with Gold threads and three other colours and I like it very much how pleasing the colour goes with my pale but also reddish complexion – the cream one is the perfect white for me. It is so soft and delicate fabric – I feel like a princess touching it and love the subtle shine. I will use this as base but also single wrap. It gives volume too, I can wear it without a shaper. Love love love Israeli tichels. Lightweight with a shaper underneath. I wear them to work. This morning l tried new wrap with 3 tichels and braids that l saw Andrea do on video. I used navy, cream and black. Colours not vibrant to wear in work setting. Takes time to do but l love the outcome. Thank-you Wrapunzel. This was my first tichel from Wrapunzel and it’s wonderful. I wore this to the Farmer’s Market last week in 90° heat with high humidity and I was not sweltering. I actually think I was cooler than I used to be just with my hair in a ponytail! I definitely will need more of these in my collection. 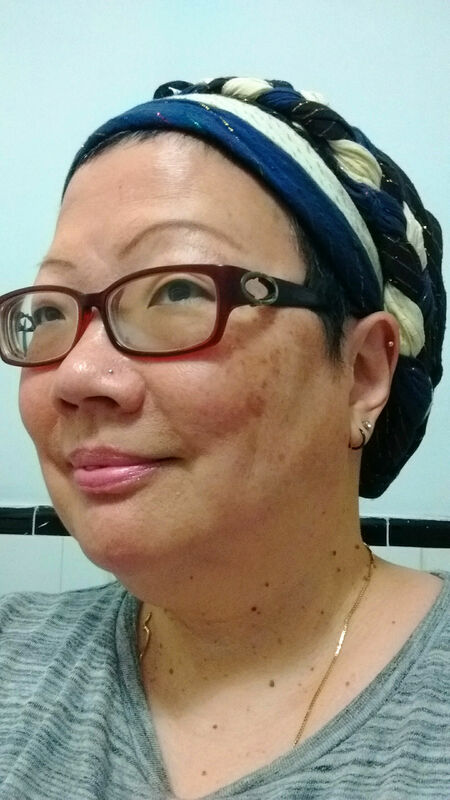 I received the Israeli tichel in Black as a gift, and honestly I’m not in love with it – I find that the cotton is kind of stiff and wrinkly, and kind of thin. I also feel a bit uninspired – it would be nice to see photos of these wrapped because honestly I don’t really know what to do with it! I expected not to like these. I don’t usually wrap with anything other than long, rectangular scarves (the longer the better, really). I didn’t think a square would be good. I didn’t think it’d be that pretty. So I ordered one. Just something to have to add a pop of colour and sparkle. Boy…I couldn’t have gotten it more wrong. Not only is it actually very pretty – the colour is lovely and the metallic threads running through it add that subtle interest and bring it up a few levels – it’s actually nice to wrap with. It’s great to throw on over no volumiser (just a small bun) to keep my hair covered and it’s light and breathable enough it feels like I’m barely wearing anything. Looks good enough to dress up nice in, is sturdy and breathable enough to work out in. You really can’t beat this level of versatility. And no fringe means it’s easier to keep it looking neat, and you can layer it with other scarves easily. I can’t wait to stockpile my stash with more of these. You should too! So cool. So light. So perfect for warm weather or any day. So light. So cool. Just the ticket for summer. The gold threads add a beauty to these scarves – I get a lot of compliments! I am not as experienced with wrapping square scarves and I had a bit of trouble getting the front crisp and flat (see photo). I do love the gold treads and the weight is light and great for the heat of Texas. I like how it didn’t have any fringe to deal with. Someone else mentioned that they work when not layered and this is definitely true. I like the opaqueness. I think the gold threads add a touch of visual interest and texture in what would otherwise be a plain nondescript scarf. Overall the colors are more subtle and soft than I prefer. I like richer deeper shades. My first impression of this tichel was somewhat negative. They looked a lot duller in the packaging than they did on the website, the shape was unfamiliar to me, and only one of the tichels I bought matched my favorite pashmina. But I couldn’t afford to buy a new set (I bought three), so I shrugged and wore it. I’m so glad I did. These tichels look a lot more ordinary in the envelope, but they take on a whole different life when you put one on your head. The silver threads shimmer in the sunlight, the colors show their understated beauty, and the shape is so much easier to deal with when you know how to work with it. The tutorials are indispensable for this purpose, so go watch them! The only thing I regret is not getting them while they were on sale! I absolutely love these tichels. They are SO sturdy and are perfect basic wear. The Lurex has yet to snag. I wish there were more colors available because I would buy them all! Peach is my favorite. One of my first Wrapunzel purchases. I love that it doesn’t slip, even without a headband. I started covering at church services within the last year, and have been experimenting with different styles. This tichel was the first item I ordered from Wrapunzel, and I couldn’t be happier. 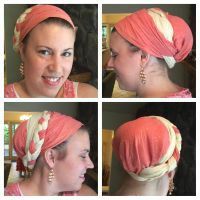 It’s so versatile, fabric is high-quality, there’s no fringe to get tangled (which is a problem with another tichel I have) and the price is more reasonable than I’ve seen anywhere else. Definitely planing to order more in the future! I truly love these tichels. They are the perfect lightweight tichel for a warm and humid state like Florida. Easy to wrap and go. I warn about washing…they do bleed. So, handwash or wash in like-colors. The material is pretty sturdy but still light enough to quickly snag. I have had to return a tichel or two because they arrived with loose threads and Wrapunzel was quick to fix the issue by providing a credit to my account or sending another one. Just finished ordering 9 more. I hope Wrapunzel brings in more colors like orange-red, and burgundy. I love my new Tichel set! If you are on a budget and want to look fabulous for your husband while on the town this is a go to product! I would like to re-review these tichels in all due fairness since my last review was based on my experience with the first and only one I had owned and worn. I’m a big believer in experiments, experience and non-generalized opinions, so, based on this and the facts that I got from Wrapunzel I decided to purchase a few more. 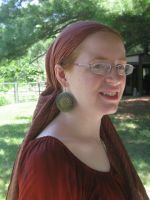 For the past five days, I’ve been wearing two Israeli tichels around my head while I cleaned for Pesach. I’ve deliberately touched them with damp hands. No dye leakage or transfer. I’m going to continue wearing them and then hand wash in cold water. I’ve also ordered a few more during the sale. They’re very soft, and the gold threads elevate them to dressier status. They’re also very comfortable and lightweight for the summer, and ample enough to wrap into different styles. I’m very happy that I gave them another chance and hope to get a few more colors, especially cream and gold. I have several of various colors and are perfect for summer. I can even wear a broad brim hat over it. I would love to see it in a light pink. The original Israeli tichels came in a lovely pink, and it would be great to get one of these in a light pink. Hi! We already emailed you about this but just so it’s here too – we’re so sorry to hear about this! It’s not normal for these tichels to bleed as you described and it sounds as if yours may have come from a defective batch. We’ll be happy to refund you or give you a store credit for the full value of the tichel and we’ll check and make sure this isn’t an issue in the future! Thanks so much for the detailed and honest feedback! I just received the green and gold tichels. I’m going to post a bit of a less than positive review. On the plus side, it’s sized very generously and is both lightweight and yet substantial. It will offer many different wrapping options, depending on how it’s folded, especially to a more experienced wrapper. The gold threads elevate it above an average, every day tichel. On the minus side, even though my hands were completely dry, after I tried it on straight out of the package to see how it would fit, my hands and nails were very badly stained green. It did wash off with soap and water, but I’m a bit concerned about wearing it on a hot and humid day because I don’t want this happening to face and scalp especially in NYC and Florida summers. I bought this especially for those days. I’d give it five stars if it weren’t for this. I would love to purchase more because of all of the positives, but I’m not because of the potential of everything but white and cream dye transfer. I have the chocolate an a light green and some other colors. They are great for layering. Also become so much better after you’ve washed it. They become more flexible. Love this scarf! As one who has many other Israeli scarves in her stock, this one takes the cake by far. It’s the perfect size, thickness, and a dream to wrap. I love the colors it comes in. It’s higher quality than other Israeli scarves. Definitely a perfect basic scarf to have on hand for anytime. This was the very first scarf I ordered! 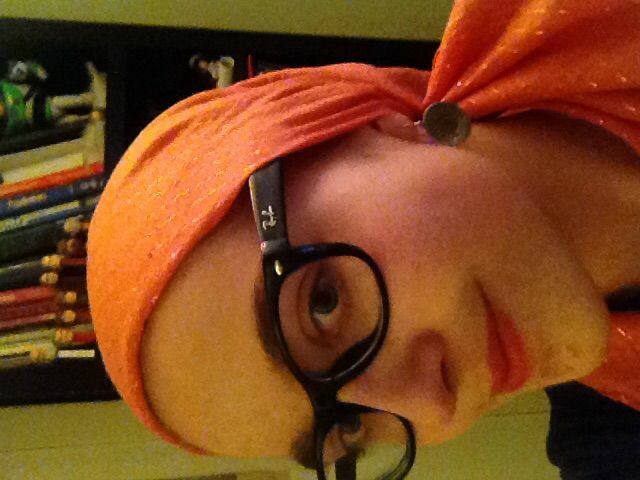 It is quite different in that it is not a long rectangular Tichel but it is very nice for just (what I call) bumming around – not in a bad sense! It’s quite comfy really. I have almost all of the silver striped colors of Israeli Tichels. They are great as sashes or for layering. They are lightweight and don’t snag easily. I also wear them around the house a lot because I can throw one on over my signature shaper and it doesn’t have any weight, but if someone comes to the door it still looks nice. These are wonderful, versatile tichels! Much more sturdy than I originally expected, though thin and easy to manage. I often use mine as an accent sash. They are so pretty with the “little line of sparkle”. I have the olive one and I love it! These Israeli tichels are much more sturdier than the previously offered version. Not quite as sheer but comfortable enough to keep my head cool. Hopefully more colors will be coming soon. This is a great scarf – high quality and very easy to work with! This scarf is a very nice version of a basic Israeli mitpachat. I have purple, and the color is very rich and wonderful to pair with other scarves. Unlike some other Israeli mitpachot, it is a heavier fabric, though definitely still not heavy, that seems to stand up to more. It doesn’t have fringe. It is also not quite square. I wish it were actually square because I find it easier to tie if it’s square than if it’s slightly off from square. I find the fabric a bit stiffer than other Israeli mitpachot of comparable weight and quality, but that I might just be because I’ve worn those others for so many years that they’ve gotten softer. Still, the lack of fringe is great for pairing with other scarves, and the quality is definitely better than most Israeli mitpachot you find online unless you search really hard. I have 4 or 5 of these now. They are a solid, meaning not see through, square scarf and great for wearing alone or with others. I love blending the Israeli tichels in with a few other types of scarves at a time for a very layered look. Important bit: if you don’t cover at home and have ever needed a scarf to tie on in a pinch (because someone is ringing the bell) this is your scarf! I just received my new Israeli tichels. I loved my old one, but these are just as lovely and I can tell they will hold up much better. I love to wear these with just a head band added for a little something extra. I logged on to review and order one or two in blue… sadly I don’t see any blue. 🙁 I’ll check back later. Just received my first order of these today – wonderful! Colors are rich, fabric is smooth and soft – kind of a “basic” Israeli tichel on steroids! Hope to see maybe some jewel colors and “brights” in the future? Pretty please?